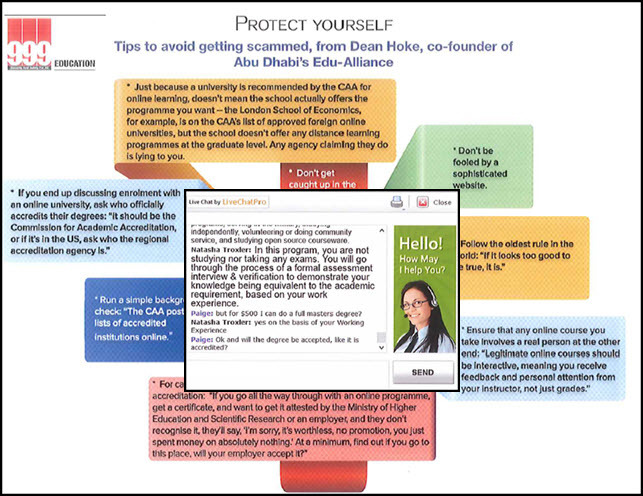 Edu Alliance in January 2015 began working with media publications to make the public aware of bogus online universities. Many of these groups who are based throughout the world are using social media such as Facebook and Twitter to advertise their “degree programs” The ads are designed to deceive people who want to complete their education quickly. Stories of these illegal practices have been written about by a leading UAE newspaper The National, Al Fanar, an English/Arabic higher education publication and reprinted in The Chronicle of Higher Education. We are delighted and honored that in April, 999 published by the United Arab Emirates Ministry of Interior (Editor-in Chief Lt. Colonel Awadh Al Kindi) published a major story called A Degree of Illegitimacy written by Paige Aarhus. We have made this available on a PDF format (click on title of story). We encourage you to read and let us know your reactions and your thoughts on how to shut these groups down. We also ask your assistance by sharing this article on the various social media outlets. How Valuable is your Education? This advertisement on Facebook claims you can “Graduate in Minutes” and gives the impress that His Highness Sheikh Mohammed bin Rashid Al Maktoum UAE Vice President, Prime Minister and Ruler of Dubai endorses them. It is a scam! A question; How valuable is your education? How valuable is education to the UAE? In my opinion the answer is priceless. In 2010 UAE Vision 2021 was launched by H.H. Sheikh Mohammed bin Rashid Al Maktoum Vice President and Prime Minister of the UAE. One of the national priorities was the development of a first rate education system and a transformation of the current education system and teaching methods. It meant students who completed their higher education would be able to find well paying jobs and be academically prepared to accept and management responsibility and eventually leadership roles. In real terms a college graduate makes hundreds of thousands of dirhams more than a high school graduate over their lifetime. The UAE higher education community consists of over 100 institutions with enrollment of 120,000 students consisting of Emirati’s and students from over 100 countries. During the past year there has been a significant increase in advertising on radio, TV and especially social media to attend various colleges and universities. Many of these adverts promote getting your degree online. Online learning for mature students can be a excellent pathway, if from an accredited institution and is academically challenging. What is disturbing are the ads, which do not identify the college and promote getting your degree quickly, with little additional study. On January a news release announced the “Middle East Office of Academic Regulation & Examination establishes institutional partnership with leading organizations to support the development, quality enhancement and expansion of higher education opportunities in the region”. The release further stated that “MEOARE is an entrusted and independent body, and operates as a representative of the Gulf Ministry of Higher Education”. In checking the website at first blush it appeared to be a legitimate organization, but then a pop up chat window appeared with an invitation to call. The organization would provide a scholarship for only a “small” fee on a credit card. The stories generated by The National and Al Fanar pointed out these deceitful practices which took money from gullible people who thought it was a “real degree” However Ministry of Higher Education would not attest the degree and most the employers did not accept the degree a Who does this hurt, well just about everyone. It hurts the person who paid thousands of dirhams to get a piece of paper worth nothing and gained little if any academic knowledge. It hurts potential students who want to go back to school but are unsure which institutions are certified. It hurts accredited schools who work hard to provide quality programs. It also hurts employers who in some cases did not do their due diligence, and accepted the degree as equal to an accredited institution. What can be done? First as the person who is interested in going back to college and getting a degree make sure the school is accepted by the UAE Commission of Academic Accreditation. Second: the local and federal governments establish a Bureau of Consumer Protection where people can file complaints, has legal authority to investigate and take actions which can fine or shut down such groups. Third: better policing or banning by social media corporations like Facebook, Twitter, LinkedIn and others. The best way to stop these groups is to quit accepting these fraudulent ads. Deprive them of their advertising outlets and a major revenue source. Fourth: remember the old phrase “If it seems too good to be true it probably is”. Don’t let yourself believe you can get your degree with little additional study or effort. Remember, all you are doing is fooling yourself.